The Sierra Nevada Red Ale is a one-of-a-kind pilot brew. How my local waterhole in New Jersey got this beer, I don’t know. But, I’ll gladly give it a try, so I brought a growler (1/2 gal) of the Red Ale home. The Sierra Nevada Irish Red was brewed at the Sierra Nevada brewery by the Vice President of Peerless Beverage Company in NJ. Check out the brewmasters notes. This red ale quickly generated a huge head, poured out of a day old Growler. Be a bit gentle, but you still want to have a good head. Good frothy head that sticks around for a long time. With the good head retention, comes good lacing on the glass. This beer is very clear, cherry wood color, more ruby color when held to the light. The aroma is a bit on the mild side, as to be expected with this style of beer. What aroma is present is slightly malty, sweet, and buttery. There is also a very mild plum aroma present. 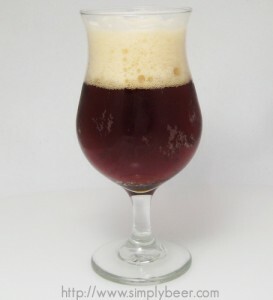 The beer starts off with a malty caramel sweetness, which fades into dry nothingness. But the finish redeems the beer with fairly lengthy mild hop bitterness. With out knowing the ABV on this beer, I would guess this is between 5% and 5.25%, either way it tastes like a good session beer. I could easily drink these all night. Thought the beginning and ending tastes were well balance. Would have liked to have more in the middle of the mouth. With the mild flavors in this beer, I would have pork chops with this beer, or other light meat. Don’t know able, but style ranges from 4-7%, putting this beer between 140- 220 calories.